Today PartyShop Group is Australia's leading and most experienced Party Accessories Retailer and Distributer, with a dedicated distribution centre located in Shepparton, Victoria and a brand new online shopping portal in development our continuity of product supply and exclusive access to the lastest in world leading party products will have your corporate event or party celebration fitted out with the world's best party products and accessories. Together we can Start This Party... and invite The World! 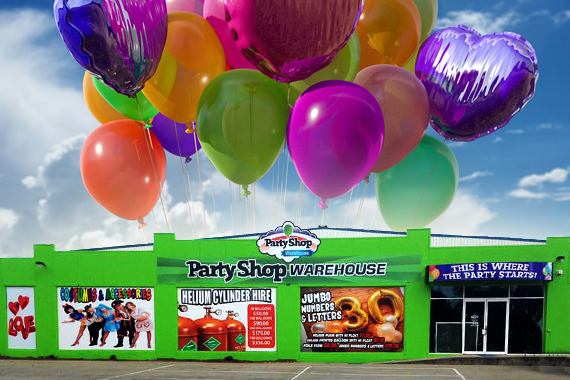 Shepparton's premier balloon and party goods retailer. Starting from humble beginnings in Shepparton, Victoria in 1991, then trading as "Just cheap confectionary" overtime morphing into "The confectionary & Party Shop", 2011 saw the organisation undergoing a major rebranding and restructuring transformation, resulting in the development of PartyShop Group Pty Ltd.
PartyShop Group have invested an enourmous amount of money and resources into the development of our dedicated product distribution centre which is soon to be enhanced by an unparralelled online shopping facility. The complexity of product supply requires nothing less than an affiliation with organisations who truly understand the intricacy of product demand and retailing globally. PartyShop Group's party stylists and consultants can help put that WOW factor into any occasion. Our passionate, dedicated team in Shepparton can guide you through the ins-and-outs of Birthday Balloons, Creative Costumes, Function Features and Practical Partyware. From small gatherings and private functions to large corporate events our Party Planners and Balloonatics have you covered..... in confetti.